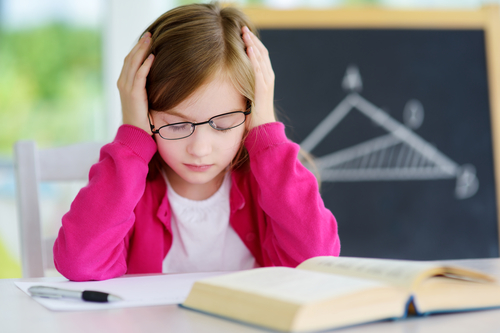 If a student can express their inner feelings, then adults could help them prevent further escalation. This can be done by engaging the student in conversation about the problem, or beginning a calming activity. Often however, the student has difficulty expressing those feelings until it is too late. 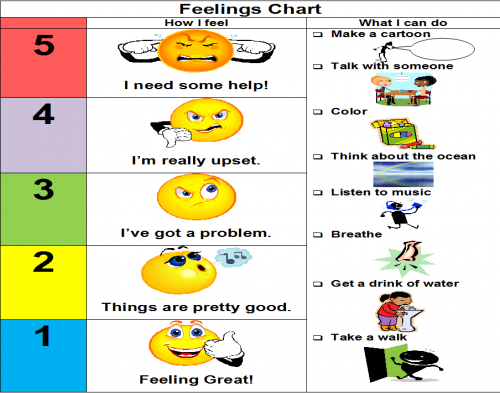 A feelings chart may be an effective visual support to help students express how they are feeling with or without using any words. In order for the feelings chart to be an effective strategy, students must understand the meaning of different feelings represented at each level. What does it mean to feel great versus having a problem? Connecting meaning for each feeling may require direct instruction. Lessons to build this understanding can be done in a variety of ways, including the use of props or pictures of self or others. The teacher can start out the lesson by describing a certain feeling or emotion through pictures, scenarios, and video clips. This lesson includes the students participating by answering questions or acting out the different scenarios themselves. Then, the teacher can assess their understanding by asking them to toss the bean bag into the correct basket for each picture, scenario or video. Once the students understand the meaning behind the different feelings, then they are able to use the feelings chart more effectively. As I entered a classroom for the first time, the teacher told me that one of the students was getting upset and was not sure what to do at that point. Although I had never met this student, I relied on the clarity of visual supports to assess the situation and determine the next best steps. I opened my computer and showed the student the feelings chart and explained each level briefly. Then I asked the student to tell me which level best described how he was feeling. On the scale from 1 to 5 with 5 being the most frustrated, his exact words were “I’m at a 4 and I don’t know what to do about it”. The student had not been screaming or hitting or throwing things. But he felt internally that he was at a 4, a very high level of frustration. Even in this heightened state, this student was able to identify some strategies that would be calming to him. We wrote a few strategies in the boxes to the right of the feelings column. He included a reading a book about planets, holding a fidget, and getting a drink of water. The feelings chart became a tool for communicating feelings and dealing with those feelings appropriately. I think my spouse is high functioning Asp., not your diagnosed. I’m in the early phase of looking for help. We will see a therapist this week.